This week we've selected five of the best opportunities in architecture and design available on Dezeen Jobs, including positions with the Metropolitan Museum of Art and Studio Egret West. The Metropolitan Museum of Art is looking for a junior graphic designer to join its practice in New York, USA. 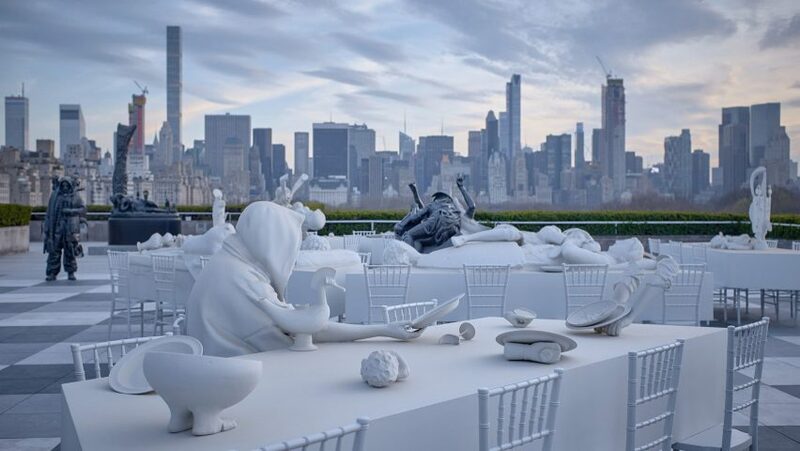 In 2017, a plaster-cast dinner party designed by Argentinian artist Adrián Villar Rojas was displayed on the roof of the Met for its annual Roof Garden Commission. White bricks infused with a mineral aggregate are used to give the facade a sparkling effect on Clapham Library, designed by London-based architects Studio Egret West. The firm has an opportunity for a project architect to join its office in Clerkenwell, London. Columbia University's Graduate School of Architecture, Planning and Preservation is offering a faculty position in history/theory of architecture in New York, USA. In 2016 Diller Scofidio + Renfro completed a vertically organised medical building at the University, which was photographed by Iwan Baan. A traditional Japanese pottery technique was used to fill the cracks in the floor of this Kyoto apartment with gold resign highlights, designed by architecture studio TANK. The practice is seeking a Dutch-speaking senior interior architect to join its team in Amsterdam, the Netherlands. Delvendahl Martin is looking for a Part 3 architect to join its growing team in London. The firm designed this double-fronted home in Oxford by combining and extending two Victorian semi-detached houses.